We consume onions almost daily, but totally unaware of it can offer to our body. Onions are loved whether white, yellow or red. We enjoy the taste and even aroma. Health practitioners have over the years recommended onions as a natural remedy to various health complications. It's time we quit viewing onions only as an ingredient to spice up dishes. A healthy body is one that constantly gets rid of waste products. Amazingly, onions fulfill this function. They contain sulphur elements that help remove metallic waste from your body. In addition, vitamin C is also an important component in them. This vitamin helps in detoxification to a great extent. Remember that as much as our bodies are designed to detoxify naturally, we are exposed to so much that it cannot manage. 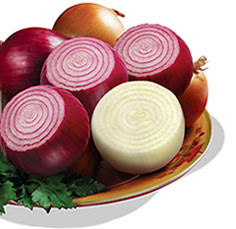 Therefore, do not ignore the detoxifying power of red onions. Onions mostly aid in prevention of stomach cancer, which has become a threat to high life expectancy. The sulfides, flavonoids and phenolics present in onion extracts prevent the growth of cancerous tumors in the stomach. They highly minimize the destruction of DNA molecules. Research by medical scholars also shows that onions have high-fiber content that reduces prostate cancer. We all agree that cancer is a life-threatening ailment; therefore, just having a little of this versatile culinary plant will save us. Whether they're cooked or raw, these vegetables are excellent for the human heart; hence people with cardiovascular complications are advised to take them. The flavonoids combined with anti-clotting agents keeps you free of heart diseases. For instance, they lower blood pressure, boost important fats, prevent blood clotting and lower triglycerides. You have the key to saving your heart and keeping it healthy for the longest time possible. Patients suffering from heart-related ailments are told to take onions daily. Good nutrition facilitates good health, and as usual what you eat makes you. All types of this lily plant boast of several beneficial nutrients not easily obtained naturally. They have fiber, calcium, folic acid and vitamins like B1, K and C. All these nutrients are essential for the normal body functioning. Fibers help in digestion, calcium aids in bone development while folic acid helps prevent birth defects. Vitamin K, on the other hand, allows calcium to bind onto the bones hence making them healthier and stronger. This bulb is rich in propyl disulphide, a compound that aids in the production of insulin, which aids in the absorption of glucose from the bloodstream. High blood-sugar level is dangerous hence consumption of onions is important. Aside from the mentioned benefits, they also are antiseptic, treat asthma, anti-fever, sore throat and cough, and help remove pimples from the skin. It is amazing how what we take for granted can be of high medicinal value. Onions are easily available and are very affordable hence can be used by anyone in food preparations they favor the most. Try this unique vegetable and watch yourself becoming healthier at no alarming cost. Try the power of onions today! Grab a bowl of French Onion Soap, a combination of sweet Vidalia Onions and tender leeks caramelized to perfection in butter, at Charlie's Bistro and Bar - a restaurant near Miami Airport. For inquiry, please call at 786 212 1512.